While postal logistics is always a key consideration for direct mail, it becomes particularly important during this time of year. The Postal Service expects to deliver about 15.5 billion cards, letters, flats and packages during the 2015 holiday season. In addition, it’s projecting about 600 million packages will be delivered between Thanksgiving and New Year’s Eve, an increase of 10.5 percent over last year’s volume. It is hiring 30,000 seasonal workers to handle this increased volume. So how do you make sure your holiday mail offer arrives on time, when the USPS network has more deliveries to make than Santa? First, a little background about Postal Service operations. The USPS Distribution Network is comprised of consolidation/distribution facilities called Network Distribution Centers (NDC) and Sectional Center Facilities (SCF) that sort and process mail for in-home delivery. Mailing activity peaks during the busy holiday season generating additional mail volume at each NDC or SCF facility. Individual facilities occasionally become backlogged with the additional volume. USPS operations management is challenged to match available staffing and equipment resources to fluctuating mail volumes. As mail service providers, we can feel this strain in the drop shipment appointment and unload process when the additional volume and activity in these facilities impacts the efficiency of the unloading process for our trucks. It’s also important to keep in mind that newly arriving mail volume is worked on a First In First Out (FIFO) basis, and USPS operations management works to advance the mail when possible to stay ahead of the flow and consistently meet delivery service standards. Operations management has engaged in a robust communications program throughout the heavy mailing season to ensure mailers are aware of the status of their network and can respond accordingly. With postal processing facilities running at full capacity, it becomes especially important to work with your direct marketing partners to maintain production and delivery timelines driven by the intended in-home date for the mail. Unintended slowdowns in the schedule (such as late art, machine downtime or logistics delays due to winter weather) can cause a greater-than-normal impact on in-home delivery. Recovery time and options during a normal time of year allows greater flexibility to maintain service standard expectations. During the busy holiday season, with large on-hand mail volume inventories, those recovery options can be more challenging. IWCO Direct works closely with USPS operations management, both at headquarters and in the plants, to ensure timely delivery of your mail and to quickly find solutions if we see any delays in processing. The Postal Service is using the tools made available by Intelligent Mail data to better predict incoming mail volume for each of its plants and ensure that mail keeps moving during this busy period. Daily monitoring of on-hand volumes and work in progress (WIP) reports from each plant has driven a culture of performance and a focus on achieving service standards. IWCO Direct makes use of the online IMb Planning Tool to monitor average days for delivery by class and shape for drop-shipped mail being entered at each facility. In addition, the Postal Service is in the process of rolling-out a new USPS Informed Visibility (IV) system. This new tool will be phased in through 2016 and will provide more detailed real-time information for mailers coordinating drop dates and facility appointments to achieve the desired delivery window. Marketers who want to better understand how their mail is being delivered across the country should consider using IMb Tracing, if they are not already. The IMb Tracing tools provided by IWCO Direct provides information on when mail is anticipated to arrive in-home, what percentage of mail has been delivered, and in which areas, if any, mail may be delayed. 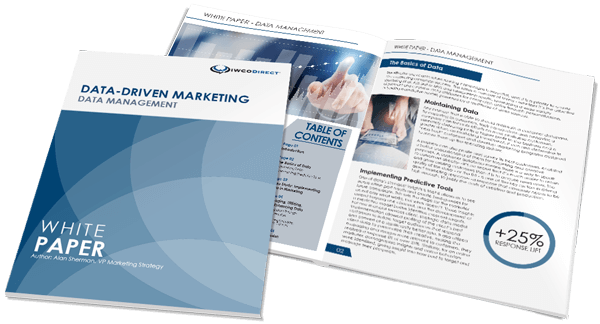 Lessons learned from prior campaigns can be applied to subsequent campaigns to make adjustments in drop strategy or in-facility dates. IMb Tracing will provide the feedback to ensure that the actual delivery meets the targeted in-home results for the Mail Plan. The USPS mail processing and distribution network has become a data-driven enterprise. Mailers need to be familiar with the tools available to use that data to their advantage. The emphasis on the application of data to manage everything from Mail Acceptance and Payment Verification to Visibility and Operations Management translates to better and more accurate information to manage and navigate the mail channel. As mailers and the Postal Service gain more experience with these new tools, service should become even more predictable and consistent. If you have any questions regarding any of the information I’ve discussed or tools to enhance your holiday mail logistics strategy, feel free to send me a note. h/t – Thanks to my colleague Bob Rosser for sharing his expertise on the USPS network operations to support this post.